The staffs were friendly and the room was clean. Bad: The beds were too old and they made sound when I laid in them, thus I couldn’t sleep the whole night. The following night I preferred to sleep on the ground. There was a construction site adjacent to the hotel which started working at 7am. The pictures which is shown on the website is their highest rate room, and they mislead me when I wanted to book a room in this hotel. 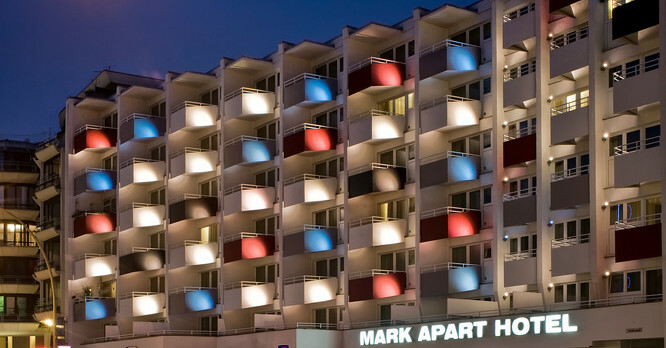 I will certainly recommend Mark Apart Hotel. Good prices and great customer service. Room clean and tidy. Nice interior decor. I am very pleased with the stay. If I will be in Berlin again, I will probably use it. Average breakfast. Good location and polite and helpful staff. Parking was good, too (24 euros for 2 days in a closed lot). Bad: Seemed like the hotel was housing a lot of school trips... Couldn’t hear anything when in our room but down at the reception and at breakfast it was pretty loud. Beds were pretty hard. Breakfast was average, nothing special but definitely alright. Location was good, not far from bus and metro station. Safe neighborhood with markets and restaurants. Comfortable beds. Bad: Next to our sleeping room was construction and very noisy in the morning. hair dryer was very poor and it took more than 30 minutes to dry heir. It was very uncomfortable in cold winter day. Wifi was a bit poor as well. it s was a very good trip with my friend. People of the recepetion was very interesting and knows the town and give us lots of tips to visit Berlin. I enjoyed my experience and I advice every body to visit Berlin and go to Mark Apart Hotel of course ! Cheap place to stay to explore Berlin but not a place to spend a lot of time. Location was good and the beds were comfy. Bad: The staff were rather rude and anything I asked them seemed like a massive effort. Also, the water in our sink initially ran yellow (after being run for a while this cleared up and we drank it with no problems). When I spoke to the night manager about this he reacted with total disbelief and was really rather aggressive. Finally, in the shower there was no shower-gel only hand soap, which was not ideal. I asked for a nice room as this was a surprise for my partner, however we were given a standard room (which isn't a problem as this is what I paid for) but we were put with a view over the large building site next door which woke us up at 7am. The hotel itself was good enough. I requested being in a top floor but they did not comply. The room had a bath and the bed was comfortable enough. The breakfast was at 6 am till 11 am. The views from floor one are horrible, you can only see a parking. Clean, minimalist rooms, located very close to the KuDam and good transport links. Staff are very accommodating and kind. Bad: Room was a bit cold, and heating didn’t function properly, but that may have been a one-off issue. Acceptable service, I have nothing to say. 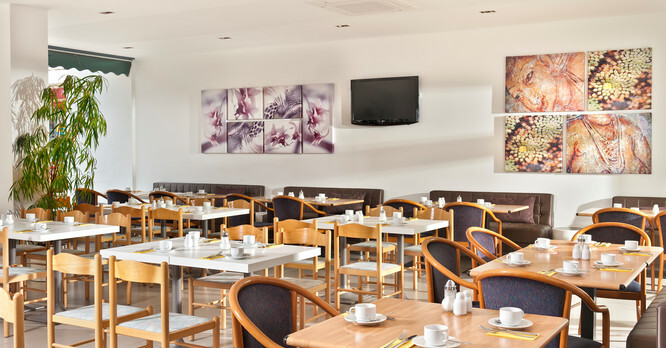 Hotel well located and close to everything, shops, restaurants, transport. I just did not like the bathroom, it was not practical and it easily gets water out. Hotel was fine, staff were fine, room and bathroom was lovely. Bad: Only drawback was waken up by the building noise outside my window at 06.30, was a pain as I had arrived the night before and was already weary because of the travel, I wish I had looked out of the window before settling in to bed , I could of been able to switch rooms. 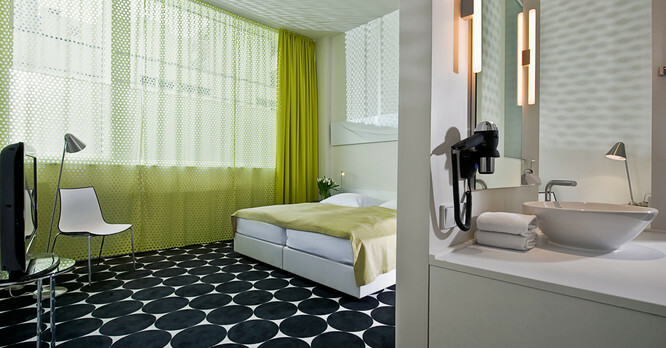 The hotel is easy to find, taking the airport bus from Tegel airport. There is a lot of work going on around the hotel, but as our rooms were away from the main road it didn't concern us. Check in is normally from 3, although we arrived just after 2, and our rooms were ready, which was great. We were on the third floor, rooms 314 and 315. Our rooms were very spacious, and there was a radiator to control the heat levels. There is a TV, however very limited to English channels - only business ones. The free wifi was fine, although you kept having to type in the user and password, when returning to the hotel. The bathroom, consists of a very large bath - very welcome, and a shower in the bath for use. There is no safe, tea/coffee making facilites, or iron/ironing board. There is a vending machine at the end of the corridor - very welcome for late night snacks. Breakfast is very plebtiful, and served from 0600 every day. I would advise taking the U metro, for all sightseeing, as it's a fair walk to most sights. But the U Metro, is close by. All in all a very good property, slightly more expensive than I would have paid, but the staff are excellent and very knowledable. We liked it all, almost. Very spacious room, comfy beds, good shower, a nice sofa, a balcony (in our room at least), enough electric mockets, which is important, a few nice chairs (well designed even! ), a nice table. Bad: We really didn't like the lack of lighting. You really cannot even read books when it's dark and lights are turned on. I wish there was an extra lamp or two on the walls. Also the pillows were too soft, but maybe it's a matter of taste. The wi-fi requires to re-login almost everytime, which is a little irritating.... it works good though. Really good breakfast, comfy beds and awesome location. Recommend! The place is easy to find, price is good, room is big and clean. I stayed for one night only arrive at night and leaving early. For me, the hotel was perfect. The rooms are very small, good enough if you just need a bed to sleep though. However, if you carry a big luggage it might have to stand next to the door. Overall it was very clean, shower and toilet was small. They don't provide toiletries apart from soap so take your own tooth brush. 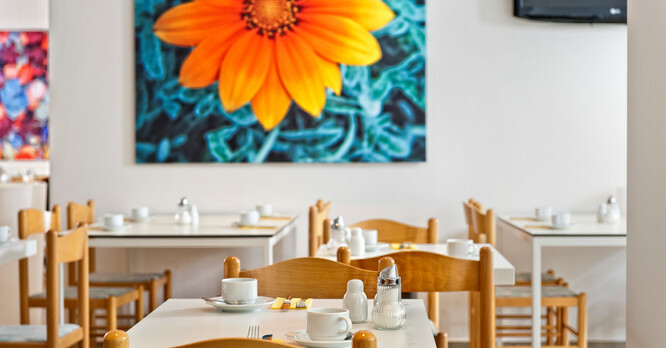 Nearby you find Lidl (a German grocery discount store) and Edeka (German grocery store) where you can also have breakfast. Kurfuerstendamm is a short walk (5min).